Kate Pullen. The Spruce Crafts, 2009. The tutorial on the following pages will show you how to make beautiful paper beads when you have made your paper beads, paper bead roundup for things to make with your newly completed beads. 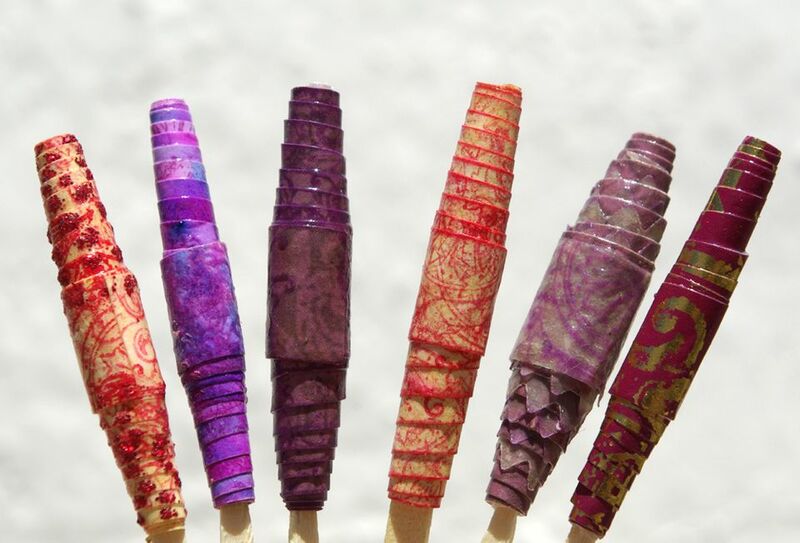 Paper beads are simple to make, and a few rubber stamping techniques are all that is required to create beautiful and unusual beads. The basic technique can be adapted in many ways to achieve different effects. This is also an excellent way to use up odds and ends of the paper. Even the most unpromising looking paper can make beautiful beads. You don't need to follow a template. However, a simple PDF printable paper bead template is on the following page if required. The paper bead template has been designed specifically for decorating with rubber stamping. Instead of tapering to a point, there is a small strip that is just wide enough to display some rubber stamping. By varying the size and shape of the paper, very different bead designs can be created. Paper Bead Template. Kate Pullen. The Spruce Crafts, 2009. Save the PDF template by right-clicking the image and then saving the file to your computer. Print onto your desired paper. See the following pages for details on how to use this free paper bead template. Stamp and decorate the unprinted side of the paper. This way the printed lines will not show. A rubber stamp with a detailed and intricate design will work well. Repeatedly stamp the rubber stamp over the page to build up a dense design. Cut the bead shapes from the paper. Tip: Ink the edges of the paper. This will emphasize the design of the bead and give a more 'finished' effect. Glue the back of the paper and carefully roll the bead. We use a thin knitting needle to roll the bead around. This helps to give a consistent result. Cocktail sticks or other thin and round implements would work equally well. Make sure the end of the paper is firmly attached, add an extra dab of glue if required. Leave the beads to one side to dry. You can seal your paper beads with a coat of diluted PVA glue. This adds strength and gives the paper beads a slight gloss. They could also be finished with a coat of clear varnish, embossed with embossing powders or even coated in resin. Other ideas for sealing the finished beads include coating the beads in melted UTEE or adding a coat of nail varnish. Add any other finishing touches such as stick-on jewels or other embellishments. Have fun using the beads, add them to earring wires to make earrings or why not thread a few onto some cord or ribbon to make a cute necklace?